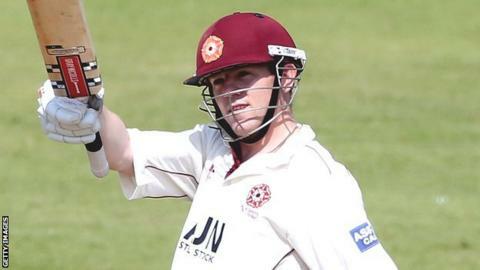 Northants batsman Niall O'Brien says he has been given permission to talk to other counties after the club decided not to offer him a contract extension. The wicketkeeper, 30, has been at the club since 2007 and scored 556 first-class runs in 15 innings this season, including 182 against Glamorgan. He told BBC Radio Northamptonshire: "A couple of counties have been in touch. "I've got a year on my contract but I was hoping that the club would extend it by another year." O'Brien added: "I'm flying away [to the ICC World Twenty20 in Sri Lanka] so it's up to the club and my representatives to try to see if they can find some common ground. "I'm not saying the writing is on the wall. Ideally, I'd love to stay at the club."